We have offered residential and commercial air sealing services to Toronto since 2008. Our team includes specially trained sealant contractors who are ideally-equipped to take care of your leaks. There are many ways cold air enters your home, and often they are virtually invisible to the human eye. This results in a lower property value, higher energy bills, and general discomfort. More than half of your hydro bills are consumed by heating. Caulking – Fully repair and seal all of the air leaks around your doors, windows and other stationary components of your home. 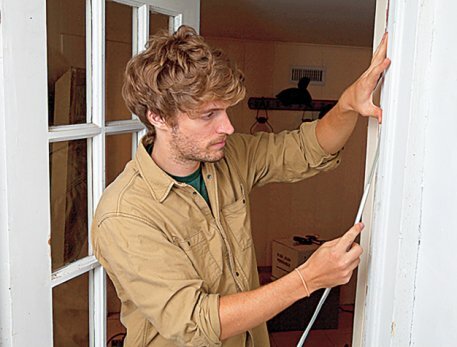 Weatherstripping – Fully repair and seal air leaks in windows, doors and other moving parts of the home. Insulation – Feeling the drafts in a particular place? We’ll insulate it, establishing additional layers of protection. Doors – Replace your doors with newer, more energy efficient models, drastically lowering your energy bills and raising your home’s real estate value. Window treatments – Upgrade your window treatments, replacing them with highly energy efficient blinds and draperies. Caulk is mainly used to seal the stationary components, such as walls and frames. Are you a business owner? A drafty office is no place to conduct important meetings and work. Our caulking contractors will remove all traces of the old sealant, thoroughly clean the area and then smoothly apply the caulk. Are you a homeowner? The areas around your doors and windows are likely the source of your drafts. We’ll fully caulk or re-caulk the frame, seams, and any visible cracks, no matter how small. Our caulking contractors are licensed, bonded and insured, with decades of experience behind them. We use the highest quality of caulk available, and our special sourcing division is on hand to secure one that is right for your space. That small gap under your door may look small, but it’s essentially a hole in your home. It’s lowering your quality of life and raising your energy bills, and creating an opening for insect infestation. Weatherstripping is the sealant used to repair leaks in windows, doors and other moveable components of the home. Our air sealing technicians will fully seal your doors and windows, and replace all traces of the old sealant. They’ll select the right type for your project and apply it right the first time. Here’s how you can detect air leaks yourself, and find their precise locations before you call a handyman service. Close all the windows in your home, shut off the furnace, and turn off all fans and exhaust fans. 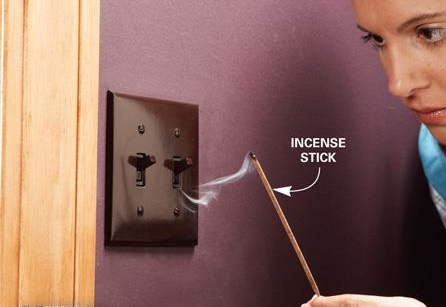 Light some incense and slowly walk along the outer walls of your home. When you see the smoke being drawn toward or away from something, you have likely found an air leak. Every homeowner should be a prepper in fall, and until March 22, we’re going to help them. One of the most important parts of winterizing your home is air sealing. Book four hours of service and we’ll weatherstrip your front door for free. Are you contending with air leaks at your home or business? Call (416) 520-1161 or book a visit through our online form. We will send a team of handymen specially trained in air sealing services to make your drafts disappear.